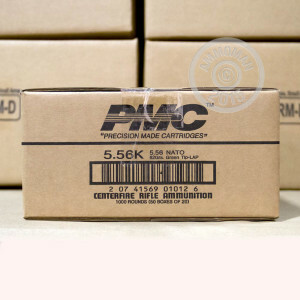 PMC X-TAC ammunition comes from South Korea, where it is manufactured to military specifications by one of South Korea's top defense contractors. This case of 1,000 rounds in 5.56 NATO uses 62-grain "green tipped" SS109 full metal jacket bullets for extra penetration at only a slight cost in velocity. Each case holds 50 boxes with 20 rounds in each box. All of the cartridges use non-corrosive Boxer primers and reloadable brass casings. Great for range use with an AR-15; check with the manufacturer before using this 5.56 NATO ammo in a .223 Remington firearm, just in case.